Eryk Pruitt is screenwriter, author and filmmaker living in Durham, NC. His short films FOODIE and LIYANA, ON COMMAND have won several awards at film festivals across the US. His fiction appears in THE AVALON LITERARY REVIEW, PULP MODERN, THUGLIT and ZYMBOL, to name a few. His novel DIRTBAG S was published in April 2014, and his follow-up novel, HASHTAG, was published today by 280 Steps. I was lucky enough to catch up with the author last month between book and film projects, long enough to have him answer a few questions. Here is an excerpt from my interview with Eryk Pruitt. How does your new novel, HASHTAG, differ from your debut novel, DIRTBAGS? HASHTAG, for one, is a little longer. Much like DIRTBAGS, it is told in three parts. It also gets a prologue and an epilogue, which I’m pretty happy about. Our characters get a chance to leave town some in HASHTAG, which is fun. I think there’s no place more beautiful, more sinister, more dangerous and more blessed than the American South, and I wanted to take the readers on a little ride, so we manage to get out of Lake Castor. How we do it… well, that’s a different story. Was writing a novel easier the second time around? I was fortunate enough to have already written HASHTAG by the time DIRTBAGS was published. However, after having gone through line edits and copy edits, it fiddled with my head during HASHTAG rewrites. I kept rewriting it and rewriting it, and even after 280 Steps took it, I still emailed them and asked if I could rewrite it one more time. Since I’ve been lucky enough to get some good reactions from people regarding DIRTBAGS, I put a lot of pressure on myself to make a book that people will like. I kind of forgot that I was supposed to have a lot of fun and that’s what people will respond to. It took me a while to get that through my thick skull, but I think I’ve got it down now. Have fun while you’re writing and everything will be just fine… I hope. S.W. Lauden is a writer and drummer living in Los Angeles. His short fiction has been accepted for publication by Out of the Gutter, Criminal Element, Akashic Books, Spelk Fiction, Shotgun Honey and Crimespree Magazine. His debut novel, BAD CITIZEN CORPORATION, will be published in 2015. His novella, CROSSWISE, will be published in 2016. 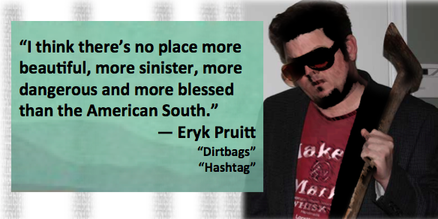 This entry was tagged #amreading, #amwriting, #writing, #writingtips, 280 Steps, crime fiction, Dirtbags, Eryk Pruitt, North Carolina, novel, Raleigh, Southern fiction. Bookmark the permalink.